The threats to cyber security are far more well known than are the solutions, and perhaps even more problematic, those threats are also more well known than are the practices and procedures that can be immediately implemented to mitigate the vast majority of threats to cyber security. Moreover, migrating to the Cloud is an inevitable conclusion. The United States Government adopted a “Cloud first” policy in 2011, and spending on Cloud technology is expected to reach $131 billion in 2017. Many of these threats have become buzzwords. 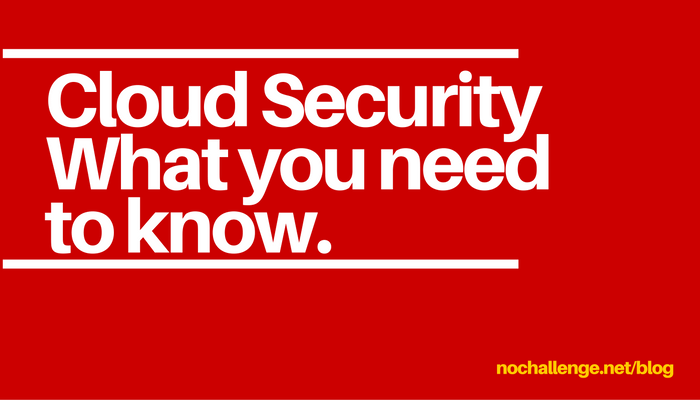 Data breaches, Denial of Service Attacks, Malware injections, Insecure APIs, etc. These are serious threats to be sure, and every precaution should be taken to prevent them. What many decision makers are yet to realize is that, in many cases, the biggest security risks a company will face come from within its own organization. Many leaders in the workplace, including C-suite executives, are convinced that their own servers and internal hosts are a better and more secure option than is Cloud hosting. However, in nearly every case, reputable Cloud hosting services can offer scalable security that far outreach traditional server hosting security. Two of the biggest IT risks are an organization’s failure to conduct an annual security assessment, and it’s lack of employee policies enforcing internet and data usage. Even more concerning is the often held belief that, overall, the cloud isn’t secure, but our own systems are fine, despite an ever increasing number of attacks to private servers. So then, how do reputable Cloud hosting services suggest you mitigate these cyber risks? First let’s breakdown what you can start doing right away today. Create and enforce a security policy as it pertains to internet and date usage in the workplace. Setting guidelines and making sure they are clearly communicated will help ensure internal compliance. Involve IT executives. IT professionals can be helpful in both creating policies that work for your industry and office, as well as assist in enforcing them. Conduct an annual IT security assessment. We suggest a local, trusted firm. Be prepared to talk to your specific weaknesses, concerns, and be willing to take action. More specifically it’s a good idea to ask yourself, who are the reputable providers, and what security solutions can they provide me on day one? At NOCHALLENGE Technology, we offer Cloud hosting on three platforms. Amazon Web Services (AWS), Microsoft Azure, and Oracle Cloud Hosting. Let’s take a look at some of the general benefits offered by these trusted providers, and how they can help secure your data out of the box. Third party data centers – While this may seem counterintuitive to many, hosting your data in one, secure location exposes you to far less risk than having your data broken up on several less-secure servers. Low Infrastructure Investment – One of the greatest costs of traditional server hosting is the hardware itself. The Cloud mitigates this almost entirely. Strict regulatory standards that are implemented and met on a global level. DDoS Mitigation – A larger company is better equipped to handle larger, and more complex cyber attacks. Efficient Resource Utilization – Use only the space that you need, which allows for simple scaling up when your business needs grow. Policy driven security that fits your specific business needs. The ability to detect threats faster and with more accuracy. Dedicated space on corporate utility grids. Environmental controls to all mission critical systems such as sever and networking hardware, and heating and cooling controls that often lead to traditional server crashes. Contact NOCHALLENGE today to find out more about our Cloud hosting partners, the services they provide, our personal guarantees, and even more details on how Cloud hosting will provide you the security and peace of mind that your company and its employees deserve.